Secretary Lehman on board the battleship New Jersey in 1982.US Navy photo DN-SN-83-00939. About the time that he was named Secretary of the Navy in February 1981, John F. Lehman met with two of our mutual friends—James Woolsey, previously Under Secretary of the Navy, and Dov Zakheim, a defense policy expert. * Without my knowledge, Woolsey and Zakheim proposed me for a position in Lehman’s secretariat. I had known Lehman, albeit not well, for about a decade as we attended conferences and both were members of a dinner group sponsored by the Georgetown Center for Strategic and International Studies. “What team?” was my response. Three days later, on 23 March, I met with Lehman in his Pentagon office and he asked me to accept the position of principal deputy assistant secretary of the Navy for research and development. Specifically, he said that he wanted me to determine what would be the impact of each new Navy program on the Soviet Navy. For several reasons I was unable to accept his generous offer. The previous year I had retired from industry (Santa Fe Corp.) and was now an independent consultant and was doing a lot of writing. If I were in the government I could not publish my forthcoming biography of Admiral H.G. Rickover, who was still on active duty. Also, I was having too much fun and making more money than I would have in the government. Lehman did not accept my refusal well: Dispute No. 1. When Zakheim learned of this situation, he mentioned to Lehman that I was a strong supporter of his. Subsequently, Lehman telephoned me and asked if I would serve on his Naval Research Advisory Committee (NRAC). I accepted and, in two periods, I would serve almost 11 years on NRAC. It was a mind-opening and invaluable experience for me. Dispute No. 2 with Lehman came when he was proposing the reactivation of the four mothballed Iowa-class battleships. Ironically, the very first article that I had published in the Naval Institute Proceedings many, many years earlier had argued for bringing back the battleships! But in the 1980s I believed that the funds for battleships could be better spent on other Navy programs—and said so in television interviews. When Lehman stepped down as secretary in April 1987 the Navy’s budget was cut precipitously. Expensive to man and to operate, and although useful in several roles, the four dreadnoughts were soon returned to mothballs—one in 1990, two in 1991, and, finally, the Missouri (BB 63) in March 1992. Lehman soon got over his “mad” with me. Dispute No. 3 occurred after Under Secretary of Defense Fred Ikle asked me (as a consultant) to undertake an analysis of the Navy’s planned “super submarine” Seawolf, then known only as the SSN-21. Provided with an office in the Pentagon and a Navy commander to assist me, I conducted the analysis using reports and papers provide to me by Ikle’s office. My report was secret and, when completed in January 1985, was handed to Ikle and his then-deputy, Dov Zakheim. A copy soon found its way to the Chief of Naval Operations, Admiral James Watkins. 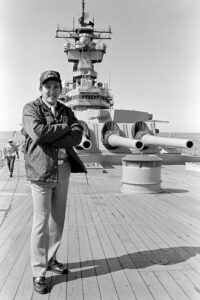 A nuclear submariner, Watkins was a strong advocate of the Seawolf program. Fuming, Watkins sent Lehman a “nastygram” on 11 February 1985, accusing Lehman of putting me up to writing the report: “I would not comment on his [my] motives but it seems odd that he would use the special access you have given him as a member of the Navy Research Advisory Committee (NRAC) to work actively to defeat decisions you have made. That he would use this access and information gained, to write in opposition to your decisions… is especially troublesome.” Lehman had absolutely nothing to do with the report. I had received no information on the SSN-21 through NRAC. Obviously, Watkins had not read the report, stating—and contradicting his statement about my gaining information through NRAC—“he has not had detailed access to [predicted] SSN-21 performance data, he continues to make statements as if he had carefully reviewed this information.” In reality, Ikle had made available to me all documents related to the SSN-21 held by the Department of Defense, supplemented by specific data acquired by the Navy commander working with me. Lehman called me into his office—not for me to explain what happened, but to tell me not to discuss or write anything about the Seawolf until Watkins retired in 1986. The Department of Defense halted the Seawolf program in 1991 at only one submarine (of some 30 planned). The nuclear submarine community, working behind the administration, convinced Congress to fund two additional submarines of the type. Lehman left the Pentagon in April 1987 to pursue a successful investment career. We saw each other at the occasional conference and sometimes exchanged e-mails. I again worked for him in 2011-2012 when he chaired, with Dov Zakheim’s son Roger, the military and cyber committees of the Romney presidential campaign. I had the privilege of serving on both committees during the campaign. He also served on the 9/11 Commission looking into warning and intelligence as well as other issues related to the 2001 terrorist attacks. And, he has written several books, in my opinion the most noteworthy being Command at Seas (1988), primarily about building the 600-ship Navy, and Making War (1992), with the provocative subtitle “The 200-year-old battle between the president and Congress over how American goes to war.” Both of these books are interesting and highly instructive. In most respects John Lehman unquestionably was the most driven, controversial, and effective Secretary of the Navy in the post-World War II era. * Woolsey later served as Director of Central Intelligence (1993-1995) and Zakheim as Deputy Secretary of Defense/Comptroller of the Department of Defense (2001-2004). Norman – interesting article and mirrors my very limited experience with Lehman. My participation in the NRAC in the 1980’s was a valuable lesson in the ways of the Navy and DoD. Will forward interesting document signed by Lehman by SEPCOR.